A highly detailed, clean and fresh, large colour map of China [75 x 66 cm]. Transliterated by M. Kennelly S. J. Sicawei College. This map may have been sold individually, or is one of the maps contained in the rear pocket of Richard’s Comprehensive Geography of the Chinese Empire also published by the T’usewei Press in 1908. Important account of an early American embassy to the east. Roberts was appointed as special agent of the United States to negotiate treaties with Muscat, Siam, Cochin China and Japan, which he set out to do in 1832 with the ship Peacock and the schooner Boxer. Includes about 120 pages describing the culture and business practices of China. In publisher’s original cloth, and paper label to spine. The first detailed behavioural study of mountain ungulates in a little studied region - the Himalaya. Illustrated. Unusual in this fine condition. 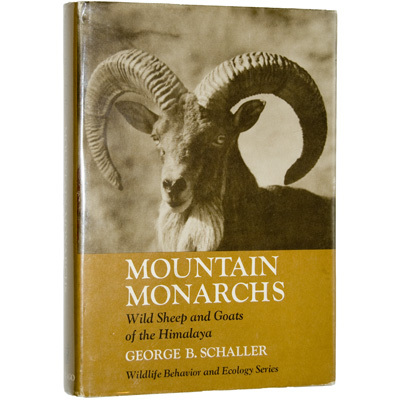 In 1968, the intrepid George Schaller began a three year study in the vast mountainous and forested regions of Central and Southern Asia, focusing his research on six species of wild sheep and goat – Punjab urial, Persian wild goat, markhor, Himalayan tahr, Nilgiri tahr, and bharal, or blue sheep. The result was this book: the first illustrated and detailed behavioural study of mountain ungulates in the Himalayas. German zoologist and evolutionary biologist Richard Semon’s account of his two year expedition to Australia, his purpose to study the country’s fauna, in particular mammals, marsupials, and lungfish. Most of Semon’s observations were made in the Burnett district in northern Queensland, though he also includes chapters on his travels through Brisbane, Cape York, Thursday Island and Torres Strait, New Guinea, and Java, together with an account of the customs, ceremonies, clothing, weapons, medicine, and decorative arts of tribes of Australian Aborigines in northern Queensland. Profusely illustrated with more than 80 full page and in-text illustrations, many reproduced from the author’s photographs, and four folding colour maps. A handsome first edition of this important work on Western Tibet, Sherring’s account of his exploration through the region during the summer of 1905, profusely illustrated with numerous photographic illustrations, together with two folding maps and a chapter by T.G. Longstaff, of the Alpine Club, describing an attempt to climb the 25,350 foot summit of Gurla Mandhata. Sherring’s journey took him through Mount Kailas, the sacred lake of Mansarowar, Kangra, Garhwal, Almora, the Kedarnath, Badrinath and adjoining territories. His narrative describes legends and myths of the holy lands, the religions and customs of the Tibetans, Hindus and Bhotias, agriculture, government, and trade routes. 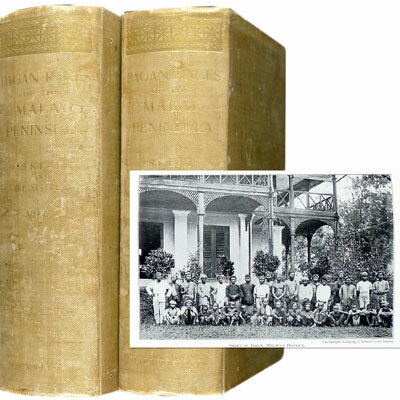 A large and comprehensive two volume ethnographic study on the manners, customs, religion, and language of the peoples of the Malay Peninsula. Profusely illustrated. Skeats adds a bibliography of most of the early literature, consisting of mainly travelogues and reports by colonial administrators and a few scholarly journal articles. First edition of this scarce work, being one of first books on Chinese medicine by a western author. Smith was the first British medical missionary in China, sent by the Wesleyan Missionary Committee to Hankow in 1863, where he opened the first hospital in central China in 1864. 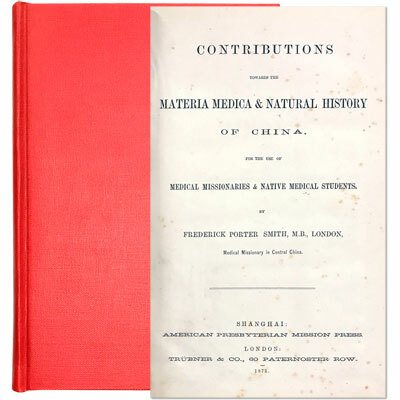 His detailed catalogue of medicinal drugs and compounds was compiled through his close work and personal exchanges with practitioners of traditional China medicine, and was meant for for use by both Western physicians and Chinese medical students. Smith also credits the early Chinese medical works from which he drew his knowledge of herbs, and of native and imported drugs from throughout Asia.